Several years ago, Section 179 was often referred to as the "SUV Tax Loophole" or the "Hummer Deduction" because many businesses have used this tax code to write-off the purchase of qualifying vehicles at the time (like SUV's and Hummers). But, that particular benefit of Section 179 has been severely reduced in recent years, see 'Vehicles & Section 179' for current limits on business vehicles. Today, Section 179 is one of the few incentives included in any of the recent Stimulus Bills that actually helps small businesses. Although large businesses also benefit from Section 179 or Bonus Depreciation, the original target of this legislation was much needed tax relief for small businesses - and millions of small businesses are actually taking action and getting real benefits. In fact, if a business could write off the entire amount, they might add more equipment this year instead of waiting over the next few years. That's the whole purpose behind Section 179 - to motivate the American economy (and your business) to move in a positive direction. For most small businesses, the entire cost can be written-off on the 2015 tax return (up to $500,000). 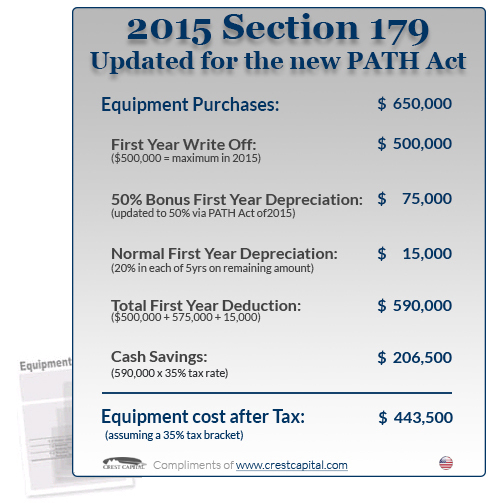 Section 179 does come with limits - there are caps to the total amount written off ($500,000 for 2015), and limits to the total amount of the equipment purchased ($2,000,000 in 2015). The deduction begins to phase out dollar-for-dollar after $2,000,000 is spent by a given business, so this makes it a true small and medium-sized business deduction. All businesses that purchase, finance, and/or lease less than $2,000,000 in new or used business equipment during tax year 2015 should qualify for the Section 179 Deduction. Most tangible goods including "off-the-shelf" software and business-use vehicles (restrictions apply) qualify for the Section 179 Deduction. For basic guidelines on what property is covered under the Section 179 tax code, please refer to this list of qualifying equipment. Also, to qualify for the Section 179 Deduction, the equipment and/or software purchased or financed must be placed into service between January 1, 2015 and December 31, 2015. The deduction begins to phase out if more than $2,000,000 of equipment is purchased - in fact, the deduction decreases on a dollar for dollar scale after that, making Section 179 a deduction specifically for small and medium-sized businesses. Bonus depreciation is offered some years, and some years it isn't. Right now in 2015, it's being offered at 50%. The most important difference is both new and used equipment qualify for the Section 179 Deduction (as long as the used equipment is "new to you"), while Bonus Depreciation covers new equipment only. The maximum section 179 expense deduction that can be elected for qualified section 179 real property is $250,000 of the maximum section 179 deduction of $500,000 for tax years beginning in 2014. For more information, see Special rules for qualified section 179 real property, later. Also, see Election for certain qualified section 179 real property, later, for information on how to make this election. Qualified leasehold improvement property. Generally, this is any improvement (placed in service before January 1, 2015) to an interior portion of a building that is nonresidential real property, provided all of the requirements discussed in chapter 3 under Qualified leasehold improvement property are met. In addition, an improvement made by the lessor does not qualify as qualified leasehold improvement property to any subsequent owner unless it is acquired from the original lessor by reason of the lessor’s death or in any of the following types of transactions. Qualified restaurant property. Qualified restaurant property is any section 1250 property that is a building or an improvement to a building placed in service after December 31, 2008, and before January 1, 2015. Also, more than 50% of the building’s square footage must be devoted to preparation of meals and seating for on-premise consumption of prepared meals. Thanks to the Section179.org group for delivering this information so concisely!